This article was published in the Queanbeyan Age on 24 June 2003. This year the annual Australasian Martial Arts Hall of Fame (AMAHOF) awards and expo was held over the June long weekend at the Harmonie German Club in Canberra. 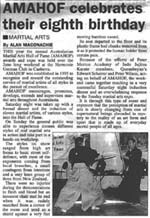 AMAHOF was established in 1995 to recognise and reward the outstanding service of martial artists of all styles in the pursuit of excellence. 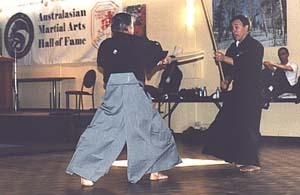 AMAHOF encourages, promotes, develops, extends and supervises martial arts throughout Australasia. Saturday night was taken up with a formal dinner and the induction of eleven martial artists, of various styles, into the Hall of Fame. On Sunday the general public was able to experience sixteen different styles of real martial arts in action and take part in a hands-on workshop. The styles on show ranged from high art forms to basic street self-defence, with most of the exponents coming from local branches, a small contingent from interstate and a very keen group of three from New Zealand. There were no injuries during the demonstrations to flesh and blood but an innocent chair met its end when it was rudely snatched from a corner of the room and used as a shield against a very fast moving bamboo sword. Its seat departed to the floor and its plastic frame had chunks removed from it as it protected the human holder from certain pain. Because of the efforts of Peter Morton Academy of Judo Jujitsu Karate members, Edward Scharrer and Peter Wilson, acting on behalf of AMAHOF, the weekend came together resulting in a very successful Saturday night induction dinner and an overwhelming response to the Sunday martial arts expo. It is through this type of event and exposure that the perception of martial arts is slowly changing from one of supernatural beings shrouded in mystery to the reality of an art form and sport that is made up of everyday mortal people of all ages.